Logan is a city of about 50,000 situated along the Utah / Idaho border just half an hour from the Great Salt Lake. With Utah being the base of the Mormon religion, it is not surprising that a religious release might be on this chart and "Holy Man" fits the bill, I guess. Scott McKenzie's hit with John Phillips' "San Francisco" was the anthem of the previous year and the duo team up again in 1968 to try and recreate the hit sound from the summer of love, but few listened to Scott now. Otherwise, this chart is interesting in that it sometimes features the current and previous hit by an artist in their countdown, as well as co-number one songs! Following their hit "Zabadak," Britain's great Dave Dee, Dozy, Beaky, Mick & Tich come back with the great "Legend of Xanadu," which was huge in their home country, but despite heavy airplay in the US, failed to dent the national charts. I am impressed, however, seeing "Nights In White Satin" listed as a "Sure Shot" ... of course KBLW would be proven right ... about four years later ... when The Moody Blues went all the way to #1 with this track. 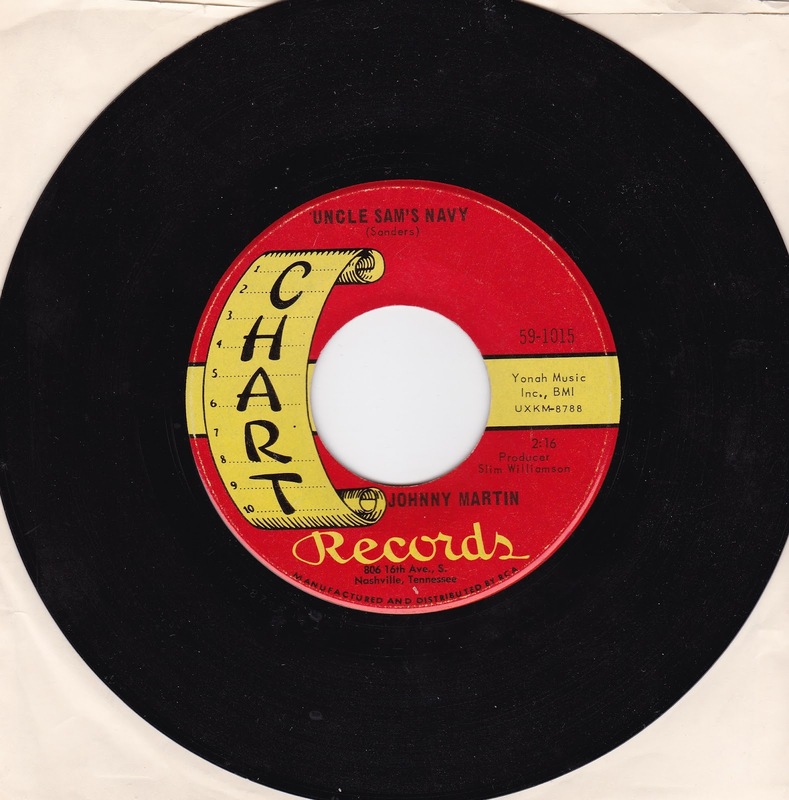 We find Dickey Lee back in The Top Ten with "Red, Green, Yellow and Blue," a song we featured a few weeks ago in our Saturday Surveys feature. It seems to me that these multiple listings should have earned it better than a #107 "Bubbling Under" ranking in Billboard. And what the heck is "Love Machine" by The Roosters? A Top Five Hit in Utah that peaked at #106 on The Billboard Chart in April of '68. For MY special track this week, I'm going with "I Love You" by People. 4/11/68: LBJ signs The Civil Rights Act prohibiting housing discrimination. That night Big Brother and the Holding Company (featuring Janis Joplin on lead vocals) make their national television debut on The Hollywood Palace. What you did see and hear was an energized performance. She looked and sounded great. 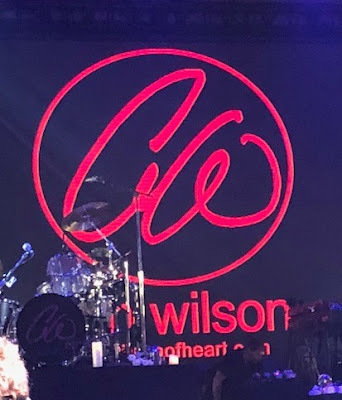 (Ann Wilson has one of the most powerful voices in rock and roll … but she is just as easily able to channel the blues and soul that clearly inspired her along the way … and she can tear your heart out when she sings a ballad, too!) she rocked the jam-packed Arcada Theatre to the rafters.) One point was made abundantly clear … no matter what material she chooses to feature (she even did “I Put A Spell On You” for God’s sake! ), THE GIRL CAN SING!!! And her reading of an old blues track, “Danger Zone,” accompanied only by a piano, which ultimately closed the show was simply beautiful. The band then came back out to take their final bow to well-deserved thunderous applause. No official word on exactly when this Soundstage PBS Special will air other than “Fall” for right now … but we will definitely keep you posted. Just a note to say THANK-YOU for the consistently great reads -- the entertainment and information gained reading Forgotten Hits is invaluable. Plus, when I hear the music legends and luminaries that pop up to comment, I realize the prominence and importance of your publication. I wish you would do mini-interviews with some of these individuals. Something like "5 Questions for ______." When I see names like Hal Blaine, Tony Hatch, Tommy James, Felix Cavaliere, Burton Cummings, Lou Christie, and a bevy of bands and broadcasters too numerous to mention, I would love to hear mini-interviews on "how it was, how it is, and how it is going to be" concerning the state of music and radio. Love Forgotten Hits! Yes, the Soundstage / Chicago program that was broadcast was heavily edited. They took out all of the talking going on between the band members and the audience, which took out some of the intimacy of the show. The broadcast was less than half of the actual performance. The first half of the show they did the Chicago II album … then they took a break and played their many other hits for over an another hour. And YES, it did sound much better live than it did on the broadcast. It did mean more by watching and reliving the live experience, than if you were not there at all. I wonder if they will release a DVD or Blu-ray of the COMPLETE concert. Probably not. Will have this in my archives in case they don't. 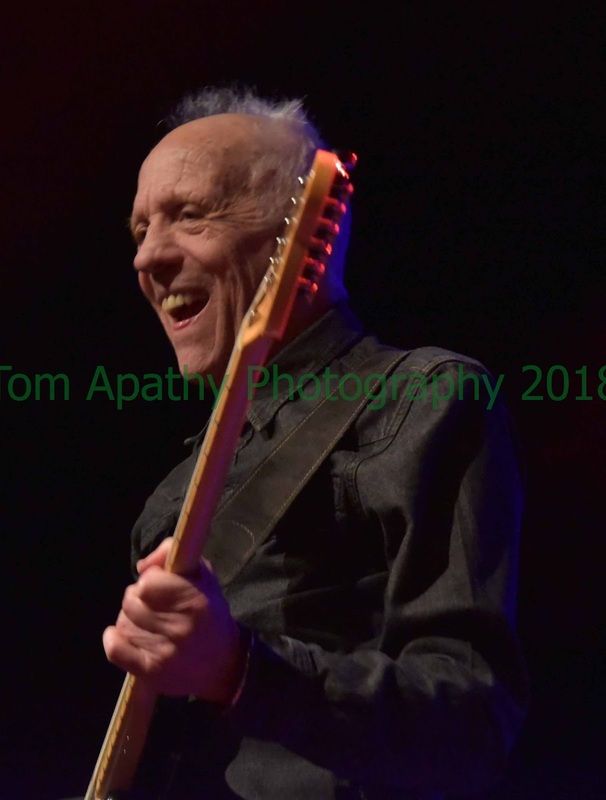 In either case, he’ll be replaced by Mike Campbell of Tom Petty’s Heartbreakers and Neil Finn of Crowded House … which should add an interesting dynamic to the band. Rolling Stone Magazine also seems to be priming us for the announcement of this year’s Rock And Roll Hall Of Fame Nominees. In a recent post they list “deserving” artists who still haven’t made the cut … yet they’re all the same artists they keep nominating year after year. Incredibly, The Guess Who STILL don’t even make the list! The Michael Bolton concert was great. I saw him in the 80's when he opened for Belinda Carlise. He sang his known songs and covers. Overall, he still has the chops. Thanks again for the tickets! I've been slammed and should have gotten a note off to you when I first saw the Al Jardine concert review. When I saw a couple of comments in today's 'Monday Morning Quickie," I decided I'd better get a reply off to you or risk my reputation. I picked up the band in my folk's 1954 Chevy wagon -- equipment and all -- drove to the auditorium, set up, did two 35 or so minute sets, mostly, or at least half 'cover' songs, had late dinner with them after the gig, and it was at the dinner at the Mansion Inn Motel, that I proposed to Murry, their original manger, that they should do their own shows, not let William Morris undersell them for $350 to $500 a night. I talked myself into a job (advance man, marketing guy and emcee) and a friendship, that has lasted 55 years (and counting). That night, Al Jardine was filling in for Brian, who was back in Hawthorne. David Marks was on rhythm guitar, Carl, lead, Dennis drums, Al filled out on bass, and did Brian Wilson's falsetto parts. Mike, at the time, was the cheerleader, front man, so to speak. That would change over the years as the others did more lead vocals. It was a great show, even in those very early years. Today, Al Jardine is singing like he's still 21, and looks great to boot. I introduced them at the Ryman about a year and a half ago and saw them in Birmingham last spring. Brian's band is incredible and they all love Brian and have a true passion for his wonderful, timeless music. I produced an amazing three shows in Sacto that year … May, September and December 21, the show we recorded for their "Beach Boys Concert" album. It was my idea to do the recording and had to talk Murry and Brian into it. I introduced them on the record, which became their first #1 Gold album. 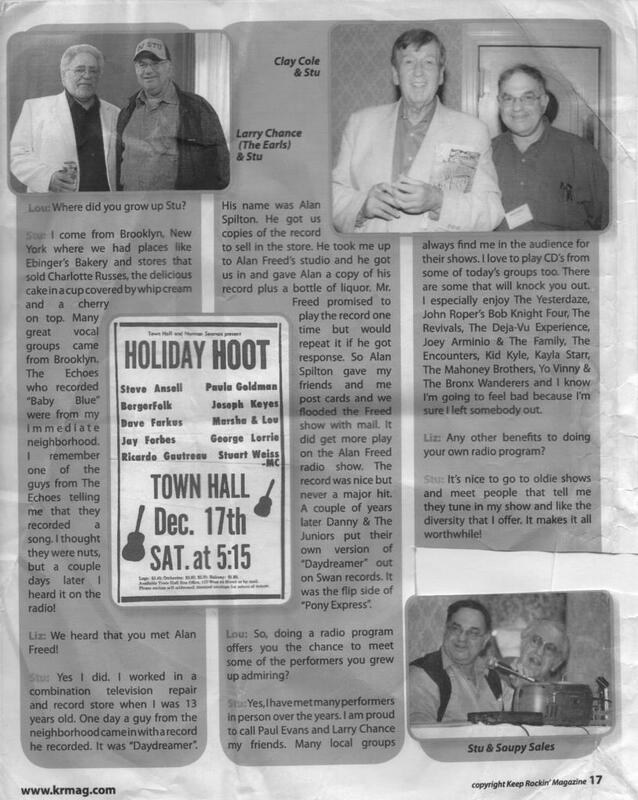 We also did the Nov 22 show, the night of the Assassination of JFK. By that time, Dave Marks had left the group and Al had returned to assume his rightful place as an original founding member of the group. Oh, on the night of the December 21 concert … billed as a 'gala Christmas concert and recording session" … the boys introduced "Little Saint Nick." The Christmas album followed in 1964. If they do the entire Christmas album front to back, what a thrill that will be -- yes, even in the heat of summer! Long-time FH Reader Frank B sent us a couple of vintage Wrecking Crew tapes to share. Al Jardine shared some nice memories of Glen Campbell during his solo concert at City Winery. The Beach Boys, of course, knew Glen from all The Wrecking Crew sessions they did … and they really got along great. (In fact, in 1965, Brian Wilson even wrote a song for Campbell called “Guess I’m Dumb” which, unfortunately went nowhere and didn’t kick-start Glen’s solo career as they had hoped it would. However, listening to it now you’ll find it to be a VERY sophisticated record for its time … and a glimpse into the future of where The Beach Boys’ music was headed as they approached the Pet Sounds era. Anyway, after Brian suffered his nervous breakdown and had to come off the road, the remaining Beach Boys approached Glen about coming out on tour with them for a while, filling in for Brian and, who knows, maybe even ultimately replacing him forever or, at the very least, becoming a sixth Beach Boy. 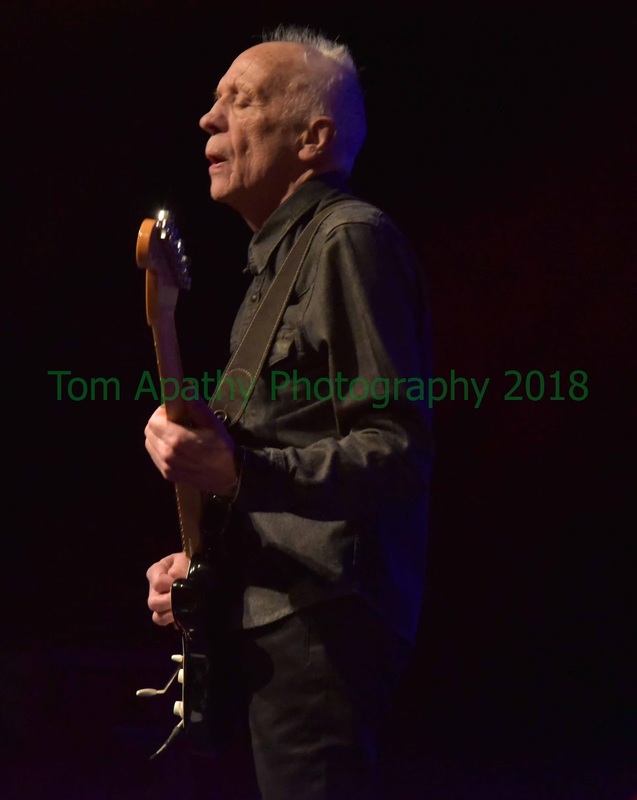 After a few shows, he approached Al Jardine about the possibility of switching instruments … letting Al play bass, allowing Glen to move back to his more customary (and familiar) guitar. Of course Al could have said no … but he didn’t … he and Glen switched instruments and remained life-long friends right up until the time of Glen’s death a couple of years ago. In fact, Glen even sang the duet with Al on the title track of his latest CD, “A Postcard From California” … and throughout his City Winery concert Al showed several photos of him and Glen together spanning the past 40 years. So there you have it … and we’ve got TWO of those tracks to share with you today. I enjoyed looking over the British Chart of 60 years ago this week that you posted on FH. I thoroughly enjoyed looking up online the #4 song by Jackie Dennis, LA DEE DAH. This is one of my all time favorites by Billie and Lillie. Had never heard of Jackie Dennie before. This appeared in a music magazine several years ago. It's a little history about my dee jay career. I may not be making money, but I have lots of fun and many new friends over the years. As I looked over the latest 'quickie' and read with great interest, and a bit of amusement, the comments on Alan, and the other artists featured in the short issue, I couldn't help but think that, like me, there is probably not a 'baby boomer' reader on your list that does not recall -- with great respect and admiration -- the phenomenal Doris Day, who's music and films have blessed us spanning eight -- yes, 8! -- generations. Like most, Doris, along with Sinatra, Nat "King" Cole, Dean Martin, Frankie Laine, "the singing rage,' Miss Patti Page, Teresa Brewer, Perry Como, Rusty Draper, Eddie Fisher, Les Paul and Mary Ford, Judy Garland, Mahalia Jackson and Tony Bennett started their careers as 'big band' singers, and, of the list here, only Tony Bennett is still at it and sounds great. Another 'survivor,' although retired for many years, is the aforementioned Ms. Doris Day. She, too, began as a big band lead vocalist for Les Brown and His Band of Renown. Her hits became 'classics' and Grammy Hall of Fame and Oscar winners, including "Secret Love," "Que Sera, Sera", "Teacher's Pet," "Sentimental Journey," "Till The End of Time," "Bewitched, Bothered and Bewildered," "A Bushel and A Peck" and "Everybody Loves A Lover." 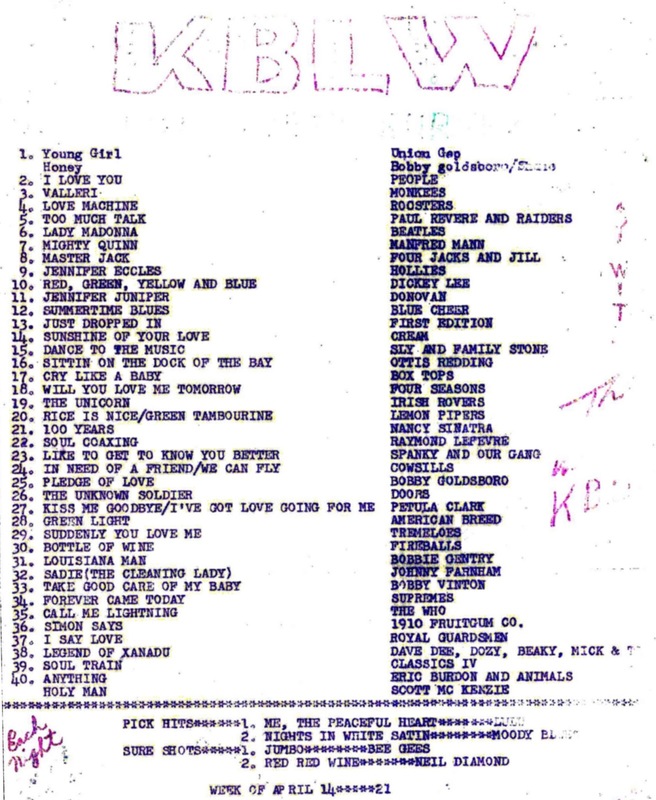 All Top 10 or #1 hits … and all etched in our minds forever. All helping to make up the 'soundtrack of our lives." Kent, I think that you and your loyal readers might enjoy this video Dave Parrett and I put together to celebrate Doris Day's 96th birthday. I did this video in conjunction with a class I'm teaching at Lipscomb University (Pat Boone is their most famous alumnus and I visited with him two Friday's ago). Doris turned 96 this past Tuesday, and lives in Carmel-By-The-Sea. Her son, whom I knew during my long association with The Beach Boys, was Terry Melcher. As you've heard over the years, Mitch Miller, the head of A&R at Columbia was no fan of 'rock and roll,' and almost single handedly held the label back from signing rock acts. Terry, who was on the west coast, took a different view. He signed Paul Revere and The Raiders, along with The Byrds, produced their initial albums, and basically got Columbia into the rock and roll business. Unfortunately, Terry passed from cancer at age 62 in '04 -- devastating Doris -- but as I said in the video, Terry did her proud. He also got Brian and The Beach Boys into Columbia's west coast studio on Sunset Blvd, near Vine, and that is where Brian produced "Good Vibrations." I know. I was there. Have a great spring and summer. The link below will take you, and your readers, to the Doris Day "Happy 96th Birthday" video. Wow! Lou Christie! I wonder if he can still hit the high notes? He sure can! I saw him a couple of years ago and he sounded great … been trying to get him back to Chicago for an Arcada show ever since! 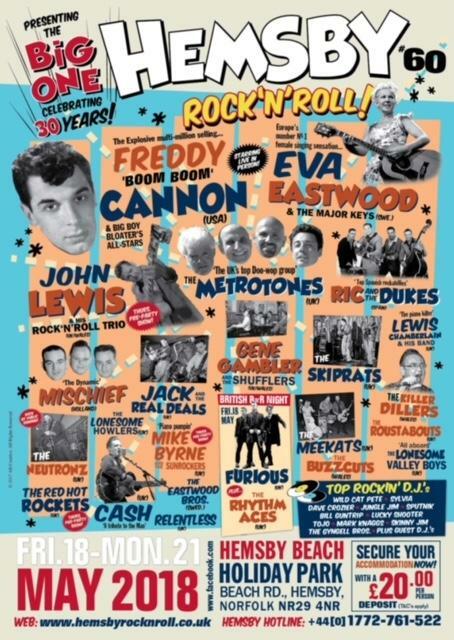 This is going to be a fun concert … Lou Christie opens the show and then Felix Cavaliere (pinch-hitting for Bobby Rydell, who broke his hip last week) mops things up. Be sure to stop by and say hello this Sunday at the Arcada show. I will be opening the show and, since some of us will be heading directly to the airport after the performance, I'm sure we will be leaving at intermission. Stop back before the show to say hello. Looking forward to the show! See you there! By the way, I read your articles on The Lion Sleeps Tonight. Here's my version – and, of course there's a story connected to it. Due to a Management and Record Exec dispute, my voice was taken off --- and Robert John's voice was put on the same record. Yikes! OK, you’ll HAVE to tell me THIS story on Sunday! See you then! Bottom Line: In our lifetime of loving music, we never really leave high school! Yes, the following would be my opinion! First off, The Doobie Brothers “Listen to the Music” is one of the Best all-time “Feel Good” Songs in the last 45 years! While they obviously sound great when singing their own song (it was a Top Ten Song and higher in 1972), listen to how it sounds when 30 musicians from countries around the world play and sing it in their natural environments all in ONE fabulous production. Every Beach Boys fan(atic) worth their vibe would love to hear this performed live. Take a listen to the five Beach Boys' original songs and think of them outside their Christmas theme. Very good, very timely (as related to rock & roll at that time), very much fun. Catch a wave this Christmas! 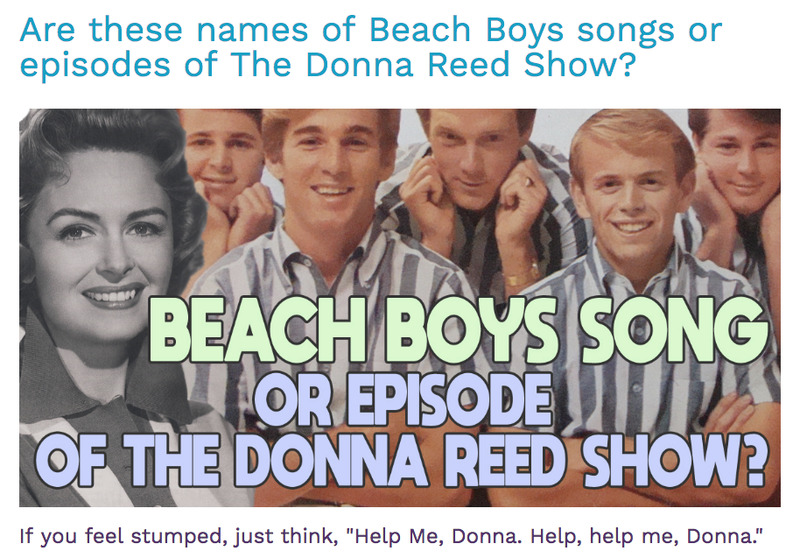 Phil also sent us this quiz from MeTV … man, if you can’t ace THIS one, you need to give back your record collection!!! The Beach Boys "Humor Album"
Phil Miglioratti and Mark Dillon (author, "50 Sides of The Beach Boys") discuss the role of humor in the Beach Boys music. Each have selected an album's worth of songs ("Monster Mash") , skits ("George Fell Into His French Horn"), and statements ("Cost too much") that put a SMiLE on your face. They approach humor as "a state of mind" that brings laughter or amusement and, in the case of the Beach Boys, allows them to poking fun, even at themselves. Thanks so much for the info on the Soundstage Chicago concert. As someone who was lucky enough to attend, I have been looking for this show ever since I was there. It was not even listed in my Channel Guide magazine. I had to go to the online TV schedule for WTTW. Look forward to seeing at least half the show again. It is on Saturday @ 11:00 P.M.
UPDATE: We watched the concert on Sunday … overall, I found it to be VERY disappointing … I get it that the program was supposed to be a tribute to the Chicago II album … but they didn’t even perform it in LP order (unless this was more inept PBS editing that messed things up.) For me, the highlights were few … catching Robert Lamm, who still looks and sounds great ... the timeless “Ballet for a Girl From Buchannon,” probably the LP’s best known track … and the fact the Lee Loughnane stepped up to the mike to sing “Colour My World,” a completely unexpected surprise … meanwhile, everything else fell short of everything else I’ve ever seen Chicago do. And I wasn’t too keen on the filming technique either … it made the whole show look very dated … grainy and faded … just not at all what I was expecting in this type of showcase. Still, I’m sure it all came off much better live before editing … this is usually the case … as the audience seemed to be having a really good time. I agree particularly with the first review that mentioned that Michael Bolton looked stiff … but it didn’t bother his voice at all … but he was moving very slowly. Cannot stand his so-called singing which sounds like some poor soul getting a prostate exam from Dr. Edward Scissorhands. While I don't think I ever would have bought tickets to see Michael Bolton on my own ... not even back in the day ... I absolutely would have gone to this show had my schedule been clear to do so. The brand new Top Pop Albums 1955 - 2016 book just arrived at the offices yesterday. It’s 1,600 pages and weighs nearly 8 pounds! I will be dropping a copy in the mail for you today. I saw Alice Cooper at the Orpheum Theater in Madison a few weeks ago. personal favorite of his ballads) How You Gonna See Me Now. I did enjoy his appearance in Jesus Christ Superstar. Even though he appeared for only one song, he was one of the highlights. Do you get free tickets often? I would have loved to see Burton Cummings. I saw him in the 80's when he opened for Alice Cooper. It was a strange pairing, but I loved Burton Cummings. This is something that is been on our minds for awhile lately, what with the reason wave of retirement announcements by so many of the music stars of our era … add to that the recent passing of many more and the fact that more and more of this music is disappearing from the radio, will the rock and roll music we all know, love and grew up with eventually face extinction and disappear completely. (God, I hope not … there isn’t any better “feel good” music out there!) What more can we do to help keep this music and these memories alive? I just now noticed something while listening to a television commercial that I have heard for about a week now. In the national ad for Arby's Roast Beef restaurants, it seems to me that in the background, very faintly I might add, is the song ARE YOU READY … same tune as the Pacific Gas and Electric's song from 1970. Here in OKC, the edited version was played on the radio (some 2 1/2 minutes long). When one went to the record store to buy it, that version was a little over five minutes long. Again, how the advertising firm came up with that song is anybody's guess. I fortunately have a copy of the edited version as well as the longer version. The other day I mentioned that I’ve been reading some back issues of Melody Maker and New Musical Express from 1965. When I came across this quote (from Burt Bacharach, no less!) I just had to share. 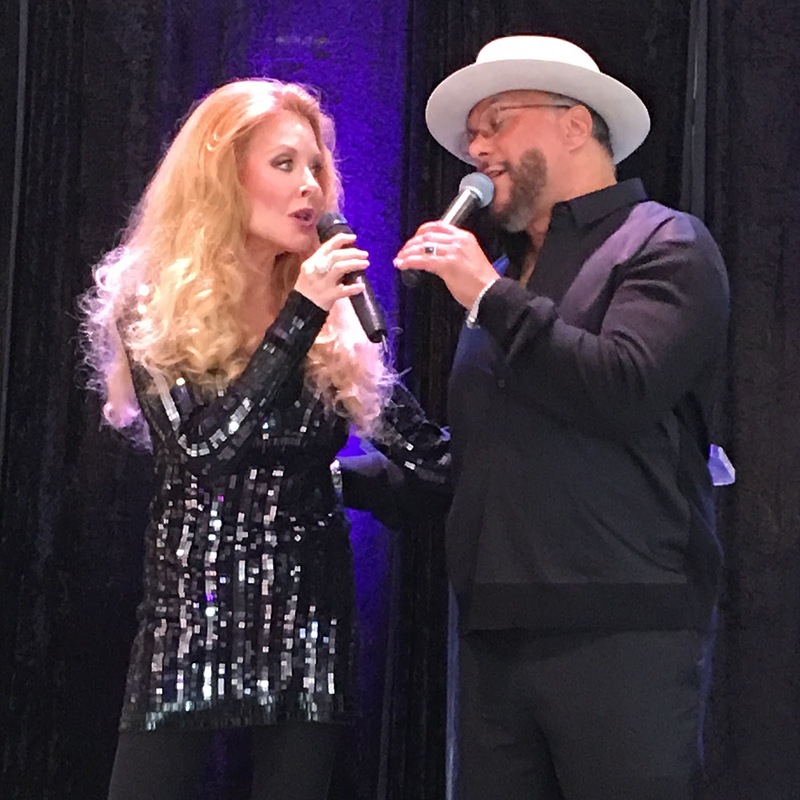 Singer / Actress REBECCA HOLDEN joined Howard Hewett (Shalamar) for a benefit given by Lifedriven in Beverly Hills. Lifedriven Foundation's mission is to provide life-changing solutions to the socio-economic problem of cancer by helping to enhance the lives and circumstances of children battling cancer in disadvantaged communities. My name is Elena and I’m Italian. Firstly, I want to say that your archive is simply amazing! All those records so well kept and protected, it looks like the Trinity college library in Dublin. I’m here to ask for your help … hopefully you’ll help us solve a mystery which began in the early 80’s. In those years, Italy was literally invaded by Japanese cartoons, that are still nowadays much appreciated and remind us of when we were young. We were all very fond of the theme songs … we used to buy the 45’s or tapes and now you’ll find all those songs in cd collections. There are hundreds of people who are trying to discover who wrote and who sang that song. They’ve also reached the network that firstly broadcasted the series in 1983, but apparently nobody knows the author or the singer. There are no credits appearing in the final theme, the song was never patented and, as they report in forums, the network owner seems very annoyed and declares that the series arrived with the theme included already. Many Italian singers who seem to have a similar voice were asked but they all denied being involved. I discovered those forums just by chance and, reading all the facts, I have come to a personal opinion: that song is probably a plagiarism. This would explain why nobody knows (or simply refuses to admit) who wrote and sang it and why the network owners let spoke their lawyers to give a stop. Well, I think the original song could be a b-side, and typing it in Google one of the results was your site. Hoping not to be too annoying, I would like to send you the YouTube link to listen to the song. I see that many readers contribute to your site by posting titles, memories and information about thousands of songs, maybe someone could recognize the melody. Thank you for your attention and have a nice weekend. Today's Saturday Survey of KLZ with the #1 record of DENVER got my curiosity aroused as to how high it made it here in OKC. For the week of February 29, it was at the bottom of the survey, listed as the PIC-HIT of the week. Two weeks later, it would peak at #24 before falling off the survey. I was a little surprised in that the record by Michelle Lee didn't make our survey though I do have a copy of it. Incidentally, today if you were ask anyone who Michelle Lee is/was, most would say an actress, especially best known for her work on the "Knots Landing" show. But how many would remember this record she made 50 years ago? Same goes for actress Ann-Margret, who had a big record earlier in 1961 with I JUST DON'T UNDERSTAND. Now on this day back in 1968 here in OKC, the #1 record was HONEY with Bobby Goldsboro / Bob Shane being listed as the artist. I have got to be honest with you in that I really don't remember Shane's version being played at all. “Honey” was one of the biggest records of the ‘60’s … I can’t imagine ANYBODY sticking with the Bob Shane version for very long, let alone long enough to SHARE the #1 position on the chart! be the answer song to Diane Renay's "Navy Blue" -- four years later. Although I don't remember where I bought my copy, I had no trouble finding it in a local record department. For years I thought it had been at least a minor hit. It wasn't until I bought my first copy of Joel Whitburm's TOP POP SINGLES book in the mid-Nineties that I realized it never even charted. When I returned to Great Lakes for school it seemed like WCFL and/or WLS could always be heard in the barracks, but I don't think I ever heard that record played on either radio station, and Chicago was a Navy town! I still like the song though and play it occasionally. Another thing: One Saturday I rode into Waukegan with a buddy who had a new car with an in-dash tape deck. I think it was a four track. I remember earlier seeing an automobile record player (yes, there was such a thing) but this was the first car tape player I had ever seen. I was quite impressed! It wasn't until I came back from England that I had my own eight track car player. I wish I had all the money I blew on that lousy extinct format! By comparison, I've still got vinyl records that I bought in the Sixties that still play very well. Like "Uncle Sam's Navy". Well, I’m not so sure this one would have caught my ear back in 1968 … I was more into “Pictures Of Matchstick Men” and “I Love You” by People! 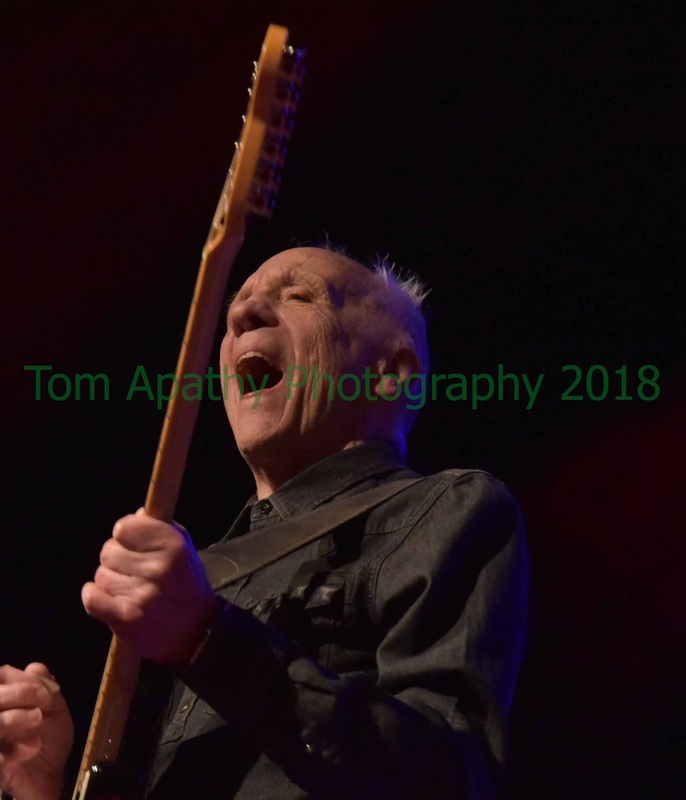 I went to the Rocksino in Norhfield, Ohio (Cleveland) on Friday to see Robin Trower, former lead guitarist for Procol Harum, who then went on to a great solo career. The 73 year old guitar legend did not disappoint with a solid performance backed only by a drummer and bass player. I was lucky to get press credentials and shoot the show from the stage front. Last Call For Ides Of March Tickets!!! We’ll be picking the winners on Friday … so you need to enter now if you want a chance to see these guys at The City Winery on May 3rd. And check this out … a recent study shows that going to concerts is good for you!!! A new behavioral science study has concluded that attending concerts on a regular basis is good for people’s well being – and could extend gig-goers lives by up to nine years. The study, commissioned by U.K. cellphone network O2, claimed that 20 minutes at a concert is better for you that the same amount of time spent doing yoga or dog-walking. Researchers calculated that a 20-minute taste of live music increased people’s sense of well being by 21 percent, compared with 10 percent for yoga and 7 percent for dog-walking. “Key markers across the happiness spectrum” also increased, with self-worth up 25 percent, closeness to others up by the same amount, and mental stimulation boosted by 75 percent. So do your body a favor a register to win a pair of tickets to see The Ides Of March at City Winery Chicago on Thursday, May 3rd!!! too!) so send me an email at kk@forgottenhits.com and get your name on the list! Thx, Kent, for announcing the ticket giveaway for the Ides Of March May 3rd show at City Winery. And though it would be great to see some first timers win, we are just happy to welcome all. We are announcing here that we will be doing a two-set show - the first being unplugged - the second full metal jacket. We feel each format has its own special vibe - the first more intimate with more stories - the next relying on the rhythm and brass and more of the hits me and the Ides are have enjoyed through the years. Can’t wait to see you!